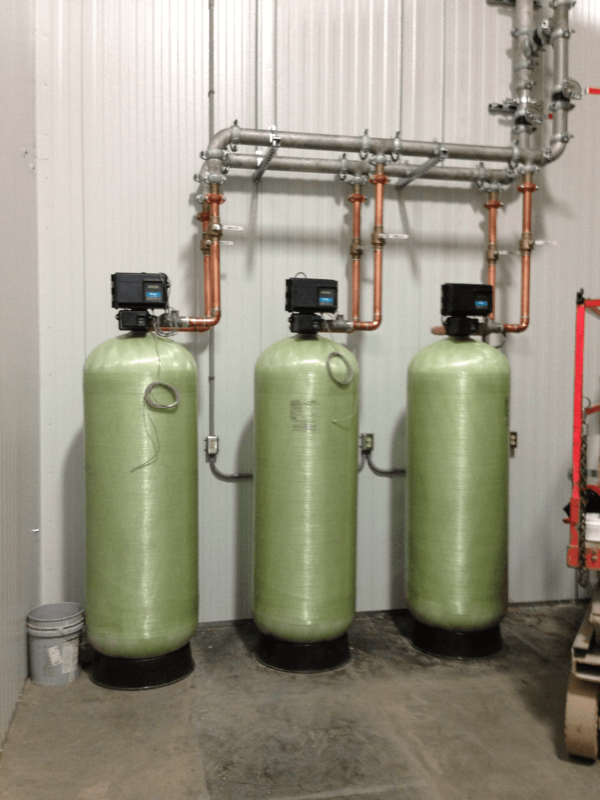 Commercial Water Softener Systems - Robert B. Hill Co. The Robert B. Hill Co. has been designing and manufacturing commercial water softeners for over 56 years. We have our standard product lines as well as the ability to custom design to the exact specifications of our customers. Commercial Water Softeners are typically used in laundry facilities, apartment complexes, hotels, office buildings, restaurants and production facilities. The most common design is a fiberglass pressure vessel with a top mounted valve. The configuration can consist of one pressure vessel to multiple pressure vessels. The configuration is dictated by the application along with flow rate and capacity requirements. Our HICAP Series commercial water softener Systems are designed for Simplex, Duplex, and Triplex Configurations. The fiberglass pressure vessel size ranges from 13 inch diameter to 48 inch diameter and flow rates from 18 gallons per minute (GPM) to 639 GPM at a 15 psi loss. The top mounted valves range in inlet and outlet size of 1 inch, 1 ½ inch, 2 inch and 3 inch. The HICAP Series is designed for the vessels to run in parallel with a vessel only coming offline for regeneration. They also have the flexibility to be programmed to run in various other configurations such as a progressive configuration. The majority of the time the units are designed with a meter that allows the user to see instantaneous flow rates and capacity remaining. The units regenerate based on volume and not on time. The STEAMPREP Series commercial water softener is designed to operate as a dual alternating unit. This means that these systems are composed of a single unit that is online at all times with another unit on standby. 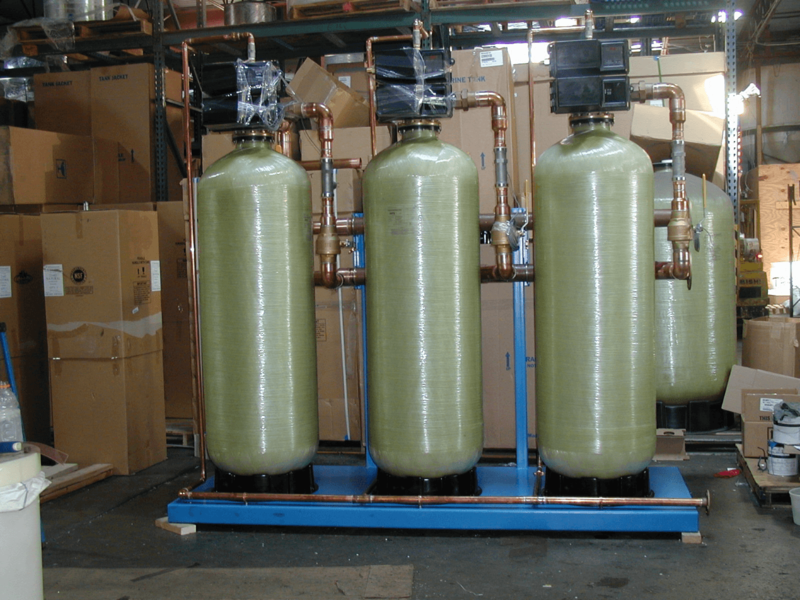 Typical applications for these water softeners are boiler feeds, cooling towers and reverse osmosis feed. Our STEAMPREP Series fiberglass pressure vessels range in size from a 14 inch diameter to 48 inch diameter and have flow rates from 23 gallons per minute (GPM) to 213 GPM at a 15 psi loss. Besides our standard line of commercial water softeners, Robert B. Hill also designs and manufactures custom systems. The systems are designed based on each customer’s unique needs and specifications. Some systems may require skid mounting with options for different types of material. Our skids can be manufactured in carbon steel, stainless steel and almost any other material that a customer requests. 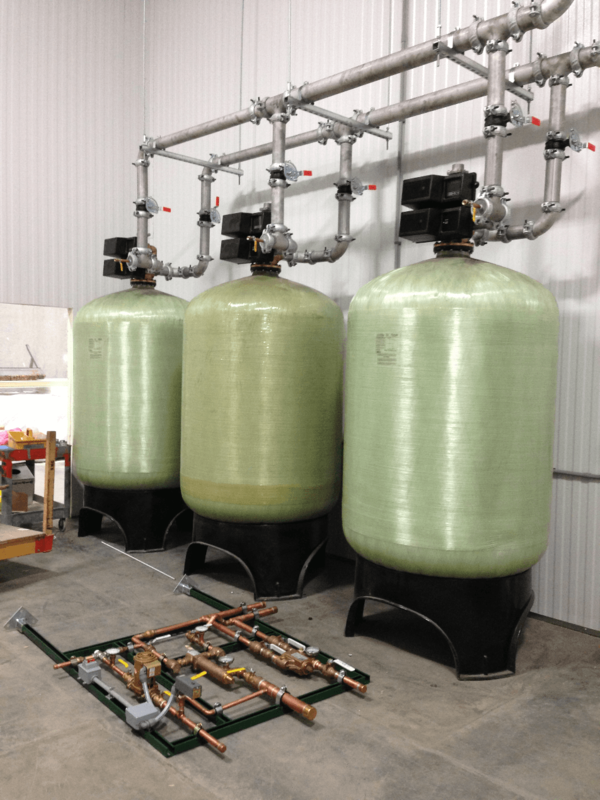 A customized commercial water softener can be piped in a variety of materials. The piping materials range from PVC, CPC, copper, galvanized, Victaulic, threaded stainless steel, and welded stainless steel. What is the incoming water quality? What is the desired water quality of the effluent? What is the daily water usage (GPD)? What is the required flow rate (GPM)? How many gallons are used on a weekly and monthly basis? How many hours per day is the facility in operation? Plans for expansion of the existing facility? Once we have an understanding of what the customer needs, we go through many calculations and figure out bed velocity, cubic feet of resin needed per day, salt usage, regenerations per day, flow rate, valve sizing, number of pressure vessels, brine tank sizing, and a variety of other variables. Our commercial water softener systems are designed to be very efficient on salt. It is critical that the equipment is sized appropriately as it maximizes the lifespan and reliability of the commercial water softener system. If you or your company is in need of a commercial water softener, would like a quote, or have any questions at all, don't hesitate to send us an email.